Even the most jaded perfumistas like myself are not immune from the occasional jerky motion or drool as we read about a new fragrance. I'm sometimes brought out of the glazed-eye/nodding-off stage when a new perfume is by a house I love and a perfumer I admire, has a great list of notes and a well-done backstory. Diptyque Kimonanthe, the newest fragrance in the La Collection 34 series, sparked desire (and hope) for all these reasons. Diptyque provided me with some of my earliest (and greatest) niche perfume experiences: I've owned (or own) L'Eau Trois, L'Ombre dans L'Eau, Olène, Ofrésia, Oud Palao, Tam Dao, Philosykos, Oyédo, Eau d'Elide, Eau Lente, Jardin Clos, L'Autre, L'Eau and Virgilio. I won't even mention countless candles and gallons of Essence of John Galliano room spray. (And I thought Hermès was my go-to fragrance house!) Though perfumer Fabrice Pellegrin has created lots of perfumes that don't appeal to me, right now I have the aforementioned Oud Palao at home, am thinking of buying another Diptyque by him, Florabellio, and own Salvatore Ferragamo Tuscan Soul Vendemmia. Kimonanthe has listed notes of osmanthus, camphor, clove, sandalwood, leather and spices (love, love, love, love, love...love). And most enticing: Kimonanthe was inspired by Japanese powdered body incense: zu-koh. Kimonanthe starts off medicinal, with a weird mix of sweet (and sepia-toned) osmanthus blossoms, fruity in the extreme, mixing with camphor and cloves. I love smelling this combination but would NOT want to swallow it. Next up is a soft leather note, that melds perfectly with the apricot-scented osmanthus; the leather becomes muskier as it fades (an interesting development). 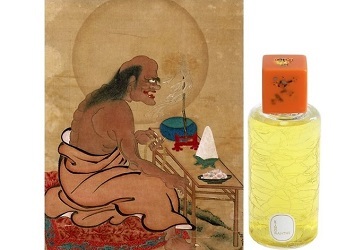 To me, the incense (zu-koh) aspect of Kimonanthe is hazy and in the background, becoming most noticeable in the base, where it smells quite a bit like Diptyque L'Eau's clove-cinnamon "antique" potpourri. Kimonanthe is a lovely perfume with good sillage and lasting power; if I owned a bottle I'd use it often, year-round. But: Kimonanthe is in limited distribution and costs $200 for 100 ml of Eau de Parfum (that breaks my self-imposed price and size restrictions). What Kimonanthe has done is make me curious about Diptyque's other three La Collection 34 perfumes: Ôponé, Eau Mage and Benjoin Bohème. Do comment if you've tried any of those perfumes. For buying information, see the listing for Diptyque under Perfume Houses. Note: all images via Wikimedia Commons. Top left image is Japanese Woman in a Kimono by Baron von Raimund Stillfried-Rathenitz and H. Andersen: Views and Costumes of Japan ca. 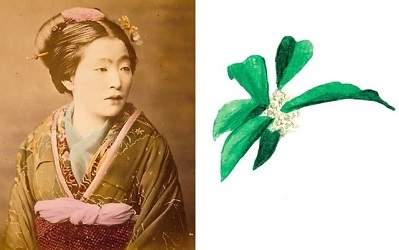 1877; top right image is watercolor of osmanthus; and bottom left image [cropped] of Arhat Kawamura Jakushi. is this a unisex fragrance? I ***so*** want to try this. I have tried the other 3, and bought a FB of Benjoin Boheme, which is gorgeous, and I say that as someone who generally dislikes vanilla. Kevin, I have manufacturer’s samples of the 3 earlier ones, I can send them to you if you want. Ping me at emc dawt 7 1 1 7 in the land of geemayle. pixel: that’s SO kind of you…I should have samples arriving shortly! It seems like we share a lot of Diptyque favourites. A bottle of the original Diptyque l’Eau is high on my wishlist, as is Oyédo. This one sounds interesting, but a bit pricey for what it is. austenfan: I always wish potpourri smelled like L’Eau…it rarely does. Can’t wait to try this! It sounds wonderful (minus the camphor!!!) I have a hard time with medicinal smells in my perfume. ???? Laura: the opening hour is VERY medicinal on this…and you can’t miss the camphor…so try before you even THINK of buying. Oh, I wanted to try the Benjoin last year, and now this, but I don’t think the two Diptyque counters in Vancouver carry it. Does it live somewhere in Seattle should I happen to be there this year? jjlook: Have not seen them at the Nordstrom Diptyque shop…. I liked this one when I tried it but then sort of forgot what it smelled like. Same with the others in this series. So I guess the impact factor wasn’t there for me like some other Diptyques you mentioned. I’m still a little heartbroken about the d/c of Virgilio. Thanks for your review! Elisa: I have a big ole bottle of Virgilio in my basement, unopened. I think I’ll open it this spring. Spritz…well, it is impossible to keep up with launches! I was very curious about this fragrance but you got me worried with saying about its sepia-like, camphorous and medicinal aspect. Lucasai, i predict disappointment for you! Good succinct review, thank Kevin. You have highlighted my difficulty with this one – that medicinal opening. After an hour or so I really really like it but that camphor…..
Dona…that opening lasts about an hour on me…. Diptyque and their special bottles – they are taking dead aim at my credit cards these days! Have you tried Auphorie Miyako, Kevin? It has a beautiful osmanthus and reminds me of SL Daim Blond, but more natural and a bit softer/hazier. Also smaller and less expensive than the Diptyque. Noz: haha! I reviewed Miyako and you commented on that post…just goes to show our perfumed brains have limits…I can’t keep track of all this stuff!! Gosh, I should have doublechecked. And that was only early August! Perfume months are starting to seem like dog years, LOL. But wait – you haven’t reviewed your favorite Auphorie yet!? Inquiring noses still want to know.